Halloween in Los Angeles: haunted house, hayrides, and corn mazes. Is there nothing more? Are South-land fright fans doomed to endless hours of chainsaw-wielding maniacs leaping from hiding places like demented jack-in-the-boxes? Fortunately, the answer is no. If your Halloween heart burns with desire for an event that honors the origins and traditions of the season, if you're tastes run more toward the high-brow, or if you are simply looking for something different, then you may be interested in October Shadows IV, this year's edition of the annual "Celebration of Halloween in Art." And if staring at paintings and sculptures sounds like less than the most spooktacular way to enjoy the October Season, take note: for 2011, the October Shadows exhibition has moved its macabre art to a new location, the Mountain View Mausoleum. What could be more appropriate? October Shadows IV features contributions from dozens of artists, including many with Hollywood experience: makeup man Rick Baker (THE WOLFMAN), production designer William Stout (RETURN OF THE LIVING DEAD), and special effects artist Stephen Chiodo (KILLER KOWNS FROM OUTER SPACE). 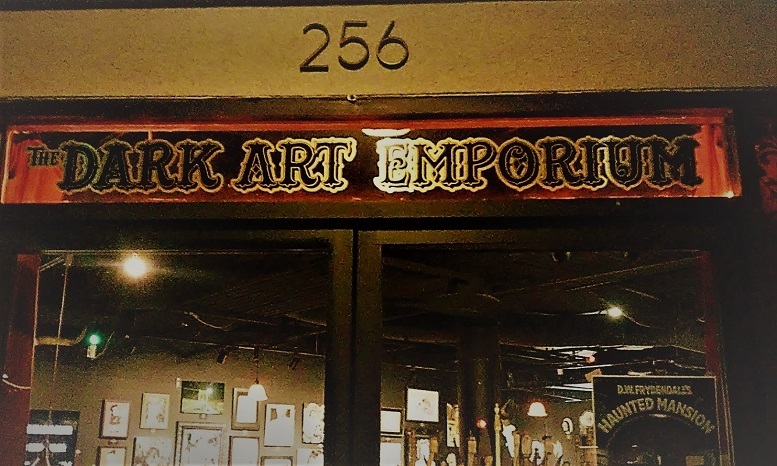 The works range from small woodcuts to life-sized statues, from traditional oil paintings to glossy digital creations rendered on a computer and printed out on glossy paper, their dark blue colors haunting in their uncanny luminosity. 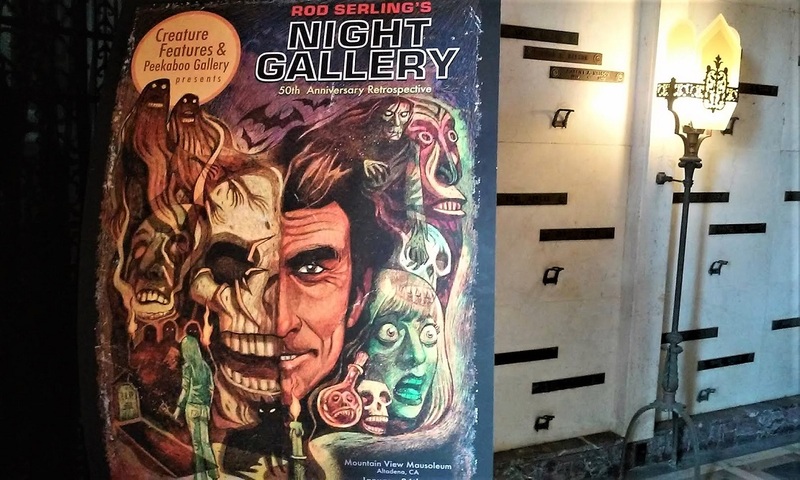 There is even a short stop-motion film on display, "Midnight Snack," which depicts what happens when Frankenstein, Dracula, the Wolf Man, and the Mummy vie for the last leftover leg of lamb in the refrigerator. In general, the contributions this year are very strong. At the opening night reception on Saturday, October 1, we were amazed by a life-like rendition of THE WIZARD OF OZ's Wicked Witch of the West, standing before us as if she were the real thing. We smiled at a painting of what looked like the critters from MY NEIGHBOR TOTORO transformed into the Halloween milieu (they are as cute as in the original anime film, but now they are bats and black cats). We chuckled at a miniature diorama of Count Chocula having breakfast (guess what cereal he eats). And we stopped for several minutes to identify the celebrity souls (Elvis, Marilyn, etc) gathered in a painting depicting some kind of midnight celebration, with frightened black cats staring from behind tombstones. Other paintings that caught our eye and/or shivered our soul included an atmospheric scene of pumpkin-headed horseback rider wielding a sword beneath a thin scythe of a moon, and an impressive rendition of Leon in lycanthropic form, as played by Oliver Reed in THE CURSE OF THE WEREWOLF (1961). Perhaps the most affecting painting is "Midnight Mourning," whose initial ghastly impression is soon belied upon closer examination. 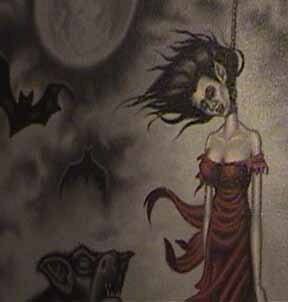 The painting depicts a dead vampire-witch hanging from a gnarled tree, while sub-human creatures - presumably her minions - howl and bay at her lifeless corpse. The despair conveyed through their twisted body language and anguished expressions evokes a surprising degree of pathos; the horror of the scene melts away, dissolved by the sight of human sympathy embodied in these inhuman creatures. If I had money to burn, this piece would be hanging on my wall now. Well, not really. Although the artworks on display at October Shadows IV are for sale, purchased works must remain on display for the first couple weeks of the exhibition before being picked up. Prices can be steep for original works, but there are many limited edition reproductions that are comparatively affordable (selling for hundreds of dollars rather than thousands). If you cannot afford those prices, Creatures Features (the company behind the event) should eventually release another October Shadows coffee table book, which will probably sell for approximately $75. The opening night reception saw several of the artists in attendance; Creature Features' Taylor White was on hand to answer questions about the event and the art on display. Drinks and snacks were served in a courtyard near the gallery (which doubles as the dressing room for Wicked Lit's Halloween plays, which will be staged in the mausoleum later this month). Veiled actresses in black mourning dresses silently haunted the marble corridors: were they merely widows, or were they the ghosts of restless spirits interred within the sepulchres surrounding us? 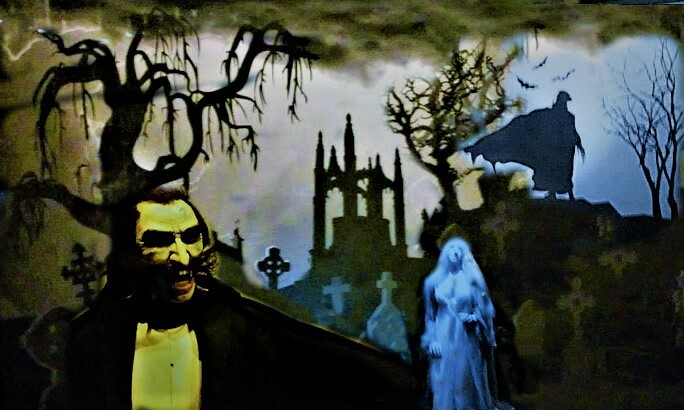 Even if you are not an art collector, or don't have a checkbook fat enough to obtain one of the pieces at October Shadows IV, we would advise a trip to Mountain View Mausoleum to savor the Halloween horrors on view within the marbled halls. The exhibition would especially make the perfect first-half of a double bill with Wicked Lit's 2011 performances, when they start up on October 21. October Shadows IV runs on Saturdays from 11am to 5pm and on Sunday from 11am to 3pm throughout October. For more information, click here.